just a few miles from Martinique to the south and Guadeloupe to the North. Dominica’s official name is the ‘Commonwealth of Dominica,’ which is mostly referenced in official communications and to further distinguish the island from the Dominican Republic, its northerly Caribbean sister. Discovery of Dominica is sure to yield a Caribbean experience unlike any other. The climate is tropical and the terrain rugged. Its breathtaking landscape reveals rainforests, rivers and waterfalls. It comes as no surprise that Dominica is affectionately known as “Nature Island”, as citizens of Dominica share their home with many rare species of plants, animals and birds. The rugged terrain offers adventurous visitors the chance to explore canyons, cycle or swing from new heights. For those with a love of nature, Dominica is the perfect birdwatching destination. Additionally, the botanical gardens house the Sisserou Parrot which is named after the country’s national bird, which can only be found on the island. Dominica is known for its spectacular reefs which visitors can explore while diving or snorkelling. Keen divers should certainly visit the signature Champagne Reef. For a less active visitor, there is the always the option to join a boating tour. From a catamaran, visitors can enjoy watching dolphins. Looking out onto the Caribbean Sea, the mountainous green slopes are dotted with exotic tropical flowers, banana plantations and coconut trees. The Boiling Lake is the perfect place to soul search and discover yourself as its renowned healing properties are considered legendary. An inclusive island with a rich cultural makeup, Dominica offers a vibrant mix of European and African cultures and serves as the home to the Caribbean’s only remaining population of pre-Columbian Carib Indians. Dominica has the honour of being nominated as one of the happiest places to live on Earth. Simplicity is key here, whether you want to walk barefoot through the pristine shore, wander down any number of green jungle trails or chill out on the beach looking onto the ocean, Dominica is a place where concerns are replaced by an overwhelming sense of peace and oneness. The main exports are agricultural and include coffee, cocoa, bananas, citrus fruits, and tropical fruits. The chief exported manufactured products are rum, timber, and soap. Tourism, which includes a budding eco-tourism industry, is also an important economic driver. 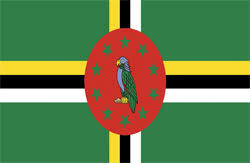 Dominica gained national independence on 3rd November 1978. Dominica has since flourished as a democracy which is patterned after the British parliamentary system. The president is the head of state, elected by the House of Assembly for a five-year term. The president appoints the prime minister, an elected member of the House of Assembly who commands the support of the majority of its elected members. One of the main benefits of a Dominican citizenship for the potential applicant would be the access it provides. Dominica itself is a safe and enjoyable place to live, with a high quality of life and English is the official language so business transactions should run without language complications. Dominica has a progressive a stable economy and fosters an investor-friendly environment. Citizenship also comes with free movement of capital, dividends and profits made outside of the island and no wealth, gift, inheritance, foreign income, or capital gains tax and no personal income tax for residents. Dominica’s Government has frequent dealings with the private sector and other foreign investors in order to facilitate growth. There are a number of flexible and tailored projects available for the investor, as many international companies are targeting Dominica to develop agricultural opportunities, alternative energy projects, manufacturing concerns, hotel resort developments and even investment in the film industry. The soil is perfect for producing a variety of fruits, produce and plants due to its rich volcanic content. The landscape is also a prime candidate for real estate development and there are a number of opportunities to work together with joint venture investments and private landowners. Dominica offers applicants the option of becoming citizens in return for a qualifying investment, which includes either a donation to Dominica’s Economic Diversification Fund, or the purchase of pre-approved real estate. The Economic Diversification Fund (EDF) was established through the Citizenship by Investment Programme as one component of a national capital mobilisation portfolio towards an ultimate goal of national development for Dominica. Generated funds are utilised for public and private sector projects where a need is identified. Public sector projects identified for financing under the Programme include (1) building of schools, (2) renovation of the hospital, (3) building of a national sports stadium and (4) promotion of the offshore sector. With respect to private sector projects, Government emphasis is on the tourism, information technology and agricultural sectors. To qualify for citizenship of Dominica under the real estate option under the Citizenship by Investment Programme, an applicant must purchase authorised real estate to the minimum value of US$200,000. US$70,000 for family of 7 or more. In order to qualify for citizenship, you must hold authorised real estate for three years from the grant of citizenship. You may only re-sell that real estate under the Citizenship by Investment Programme after five years.